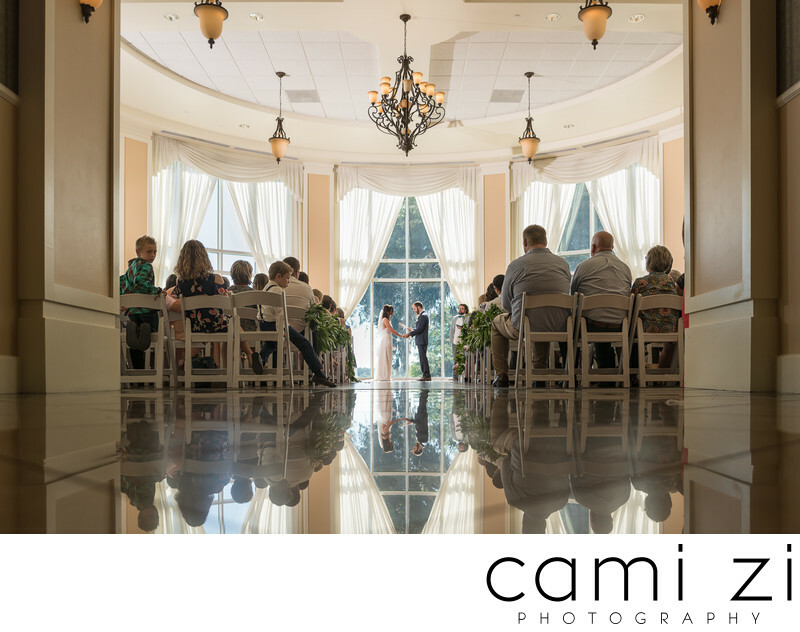 This picture features the beautiful bride and groom, Kelsey and Mason, in the Rotunda ceremony area at Lake mary events center. With the Rotunda’s great big windows and elegant tile floors, I was able to create this stunning photo of the two of them. Another aspect that helps create a peaceful ambiance in the room is the subtle touches such as; the delicate white curtains and graceful chandeliers. Kelsey and Mason were so fun and had great energy throughout the entire wedding. Before the ceremony, they had a first look and a first prayer, the emotion, and love shown between the two was wholly beautiful. I felt blessed to be able to be apart of their wedding day. Before the wedding, the bride and groom surprised the wedding party with matching underwear! This is just one example of the fun and joy we had throughout the whole wedding. Lake Mary events center is a beautiful wedding and events center located in Lake Mary FL. With the six indoor areas that can be arranged to best fit your wedding or event, Lake mary events center is a wonderful place to host any event you have in mind. In addition to those six locations, the event center also boasts an outdoor patio area and an extensive lawn that would be perfect for an outside wedding. Location: 260 N Country Club Rd, Lake Mary, FL 32746.